Dog Vacation What do you do when you want to go on vacation but you have a greyhound or two and maybe some other pets? How about taking the greyhounds with you? You can enjoy a good dog vacation. There are many dog friendly motels and beaches that provide excellent accommodations. We wanted to attend a Greyhound Weekend which is held in Dewey, Delaware every year on Columbus weekend. The year was 2000 and the organizers were hoping to have 2000 greyhounds attending. They succeeded and we had the best time ever. The town opens its doors to greyhound people; you can bring your greyhounds into shops and even some restaurants. There are plenty of vendors who come from all over the country to sell their greyhound related wares and believe me the greyhounds do love to shop. 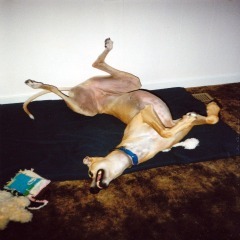 You can find anything and everything you can possibly imagine for your greyhound. The first year we attended we stayed in a motel on the beach and it was nice but nothing to write home about. But we were there to have fun, meet other grey people and spend some time with our greyhounds. Of course, we shopped too. The next time we went we were lucky enough to stumble on a nice Bed and Breakfast that had recently changed ownership and it was the first year for them to invite Greyhound People. Well talk about finding a little bit of Paradise here on earth, this was the spot. This was an excellent dog friendly vacation spot. We drove up to this beautiful home set on eight acres of land and backing up to a wild life preserve complete with creek. They have a one acre fenced dog run for the greyhounds to run and frolic and right in the middle is a lovely gazebo with paddle fan for the people to sit with a drink and watch the dogs play. This Greyt dog vacation spot is the Lazy L.
Every morning there are dog biscuits, for the dogs of course. The three course breakfast for people is just fantastic. Debbie, The Inn Keeper makes hot breads and they serve fresh fruit. Then they serve the main course, which is different every day. One morning they were serving quiche; well Bill, my hubby, is not big on quiche. Debbie told him that no one leaves her table hungry and asked if he would prefer some scrambled eggs, he still says they are the best scrambled eggs he has ever had. They supply doggy towels if you want to give them a shower in the out door shower. Each room has a cover to throw on the bed if your dog would like to lie on the bed. The amenities are too numerous to list and that list grows each year we visit. The last time we were there with Mr. T he was an ‘only dog’ because Elle had recently passed. He was still not quite himself but when we pulled up to the Lazy L he got out of the car and went right up the front steps and I swear was thinking, “Honey, I’m home”He was greeted at the door by Debbie and her Maltese who just boosted Mr. T’s spirit 100 per cent. I will forever be greytful for the kindnesses the staff showed our “only child” that dog vacation. Have you found a greyt place like the Lazy L. Please share it with us. Its easy just click this link to tell us about it. Hotels, motels, restaurants, parks, airlines we would love to hear from you..
Finding the Lazy L was truly a wonderful discovery and there are a lot of other dog vacation spots who welcome dogs as guests.. There are quite a few web sites which will list pet friendly hotels, motels and resorts. Keep in mind there are restrictions which some places have regarding four legged guests. Some restrict the size of the pet or the number of pets; others like the Starwood Hotels & Resorts have a LTD program (Love That Dog). There is usually an additional expense per dog but it is often much less expensive than a boarding facility. My daughter and I recently took a “Mother/Daughter” trip to Salem, Massachusetts. We investigated what we wanted to see and do as well as where to stay. There are a number of nice Bed and Breakfast places but the Hawthorne Hotel really drew us in. It is located in the heart of places we wanted to see and their website looked very nice. With two restaurants right in the hotel we decided that was the place for us. Upon checking in to the hotel we found it was everything was as promised and even more. The staff was cordial and knowledgeable about the town and sights to visit. The amenities were fantastic and the very best part----they are dog friendly!!! Each four legged guest receives perks of their very own and the hotel is located right next door to the hotel is a lovely park to take a walk. We will definitely go back to Salem again and this time we will bring our dogs. Check out their site. Hawthorne Hotel. Also check with the place where you will be staying for any requirements they may have regarding dogs as guests. Some will request that a valid vaccination certificate be presented. Make sure your dog is properly tagged with your phone number. If you are going to vacation where bringing the greyhounds is not an option there are some other choices to a dog vacation. Check with your rescue group if there are members who will Dog Sit in their homes. I am a dog sitter, but I do this usually for friends. The greyhounds or other breeds must be cat friendly. Since we have a sixteen year old cat who gets confused, having additional canines in the house really does a job on him. One time I found he had taken up residence in the spare litter box. Finding a good boarding kennel can be tricky. If that is your option then you should so some research and make sure you are not just putting your dog in jail while you go on vacation. Some places call themselves Dog Spas and those can be pretty pricey. There are also some services that will come to your home and watch your pets while you are away. These services can be the right solution for some people but make sure you carefully check them out. Make sure they are bonded and get some references and check the references. Vacations should as much fun for your pets as it is for you. We “baby sit” for a friend’s Goldendoodle who has a wonderful time here playing with my Harpy. He has SUCH a good time that when his person comes to pick him up Teddy will turn and run in the other direction. Really boosts a person’s ego when the Faithful Companion wants to stay on a dog vacation. To Share Your Story and Pictures with us, click here. It's easy. Try it.